A state appeals court on Friday threw out one of two counts in the indictment against former Gov. Rick Perry, handing his lawyers their first major breakthrough in the nearly yearlong case. The 3rd Court of Appeals in Austin specifically found a problem with a count alleging that Perry coerced a public servant when he threatened to veto state funding for a unit of the Travis County district attorney's office. 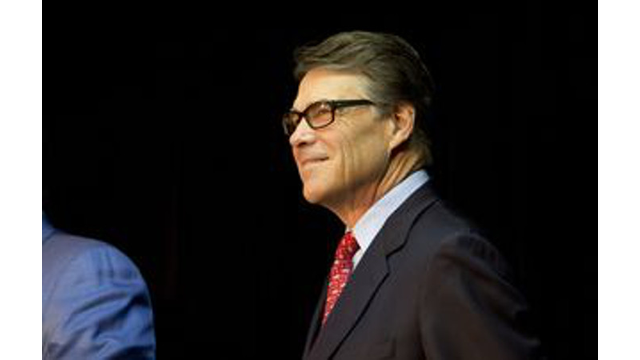 The court left intact the indictment's other count, which accuses Perry of abusing his power. Perry's legal team, led by Houston attorney Tony Buzbee, moved quickly to capitalize on the ruling, arguing it was proof the overall case against Perry, now a presidential candidate, is unraveling. "One down, one to go," Buzbee told reporters Friday afternoon outside the Harris County civil courthouse. "The court today threw out what we believe to be the greater of the two charges — that coercion charge." "The remaining count we believe to be a class C misdemeanor, and we believe that count is hanging by a thread," Buzbee added, likening such an offense to a "traffic violation." It was not all good news for Perry, though. While his lawyers were confident the remaining count would be dismissed "on its face," it was unclear how long that could take. And the appeals court ruling moves Perry closer to a trial that could be a headache during a presidential campaign. Michael McCrum, the special prosecutor handling the indictment, said he was weighing his options for how to proceed, including whether to appeal the latest ruling. Regardless, he predicted the case could go to trial late this year or early next year. McCrum took issue with Buzbee's boisterous reaction to the ruling, saying Perry's lawyers have little to celebrate. "I just can’t help but still be amazed at the disrespect he has for our legal system," McCrum said of Buzbee. "This isn’t high school football playoffs." The appeals court was ruling on Perry's challenge to a district court's decision earlier this year not to dismiss the case on constitutional grounds. It was Perry's second attempt to get rid of the indictment that now hangs over his comeback bid for the White House. "The Americans in this country are looking for a president who will stand up and do what’s right, and that’s exactly what Gov. Perry did," said Buzbee, who has donated to Perry's campaign. "This will have no impact whatsoever on his presidential campaign." Begging to differ Friday was Texans for Public Justice, the liberal-leaning watchdog group behind the complaint that led to the indictment. Craig McDonald, director of the Austin-based organization, said that the case remains a "heavy burden" on Perry and the appeals court decision goes against his primary objection to the charges. "The ruling by the all-Republican three-judge panel underlines the fact that the charges filed against Perry are not the result of a partisan witch hunt," McDonald said in a statement. "Republican judges exclusively have moved this case forward." Perry was indicted last August in a case that centers on his veto of state funding for the public integrity unit in the Travis County district attorney's office. He had threatened to cut off the funding unless the district attorney, Rosemary Lehmberg, resigned following a drunken driving arrest. At the time, Lehmberg's office housed the public integrity unit, which handles ethics complaints against public officials. Lehmberg refused to step down, and Perry later made good on his threat, vetoing the approximately $3.7 million per year budgeted to fund the unit. The appeals court agreed with Perry's lawyers that his threat was a part of the give-and-take of politics, protected by the First Amendment. In doing so, the appeals court cast doubt on how state District Judge Bert Richardson interpreted the definition of "coercion" under the law. On the abuse-of-power count, the appellate judges suggested it might too be to early for them to rule on it, especially before a trial.